This isn’t really a recipe, but more a piece of advice I wanted to pass on about a brilliant way to eat tacos. If you’re anything like me, you stuff and stuff and stuff yummy things into your taco, and then you take the first delicious bite and the whole thing collapses and you end up with stuff all over your plate, a bit of shell between your fingers, and salsa running down your arm. Save the clean-up by filling your taco with stuff, then instead of putting shredded lettuce inside your taco, wrap a whole giant cos (romaine) lettuce leaf around the outside of your taco, tucking it in at the bottom like a burrito wrap. 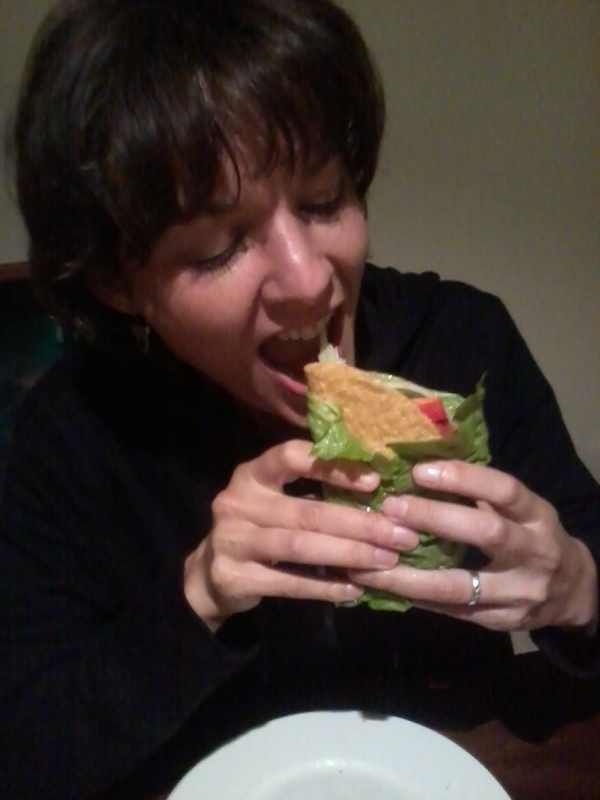 Now, it doesn’t matter how full your taco is, it will all stay inside the lettuce leaf as you eat it! Is that an ingenious idea, or what? Putting the lettuce on the outside also means you have more room inside for stuff, so it’s a winner all round! For the record, these tacos were stuffed with seasoned mashed chickpeas, homemade tomato relish, homemade moxarella cheese (recipe to come soon! ), diced tomato and capsicum, sliced avocado, and (very thinly) sliced chilis. YUM! Great idea! I’ll tell mum about that one!